Rainbows have to be one of the most incredible of God's creations. A few years ago, my brother was killed in Africa. On a walk down to a local field after this, my dad looked up and saw a rainbow. The rainbow is a symbol of promise. The rainbow, full of colour, reminds us of the promise of God, the love of God and the beauty and splendour of God. Genesis 9.12-15 - And God said, “This is the sign of the covenant I am making between me and you and every living creature with you, a covenant for all generations to come: I have set my rainbow in the clouds, and it will be the sign of the covenant between me and the earth. Whenever I bring clouds over the earth and the rainbow appears in the clouds, I will remember my covenant between me and you and all living creatures of every kind. Never again will the waters become a flood to destroy all life. Our picture comes from Charmouth in England with a double rainbow (the left one is hard to see) and the rain clouds in the distance. The rainbow was a vibrant colour, compared to the darkness of the land. This is the kind of colour and light that Jesus is in a dark world. But back to the rainbow. The rainbow was given to Noah as a sign that never again would God flood the whole earth. And as we know, God is faithful and true and this has never happened since! It is awesome that it is God who 'brings clouds over the earth'. This assures us of a God in charge of the earth and all of his creation in the whole universe. It shows us the nature of God as well. He is bright, shining, incredibly colourful, a painter and master with colour, he's both ordered and creative. He is brilliant at watercolours!! The rainbow is unexpected and beautiful, it is enormous and yet inspiring. This is our God's nature. Awesome in power, great in glory and colourful, creative, faithful. Genesis 9:16 - Whenever the rainbow appears in the clouds, I will see it and remember the everlasting covenant between God and all living creatures of every kind on the earth. A Prayer: Lord, thank you for the rainbow. Thank you that it forms when the sun shines and the rain falls. This is such a symbol of you - the Son of God who shines and sends rain to water the earth and give us drink, but who also rains down his love and power through the Holy Spirit. Thank you that you are a faithful God; you are a creative God; you are a God who does unique, inspiring and awesome things. I pray that you would do these things in my life to show your glory and fame. Amen. Rainbows aren't just found in the earthly heavens. We also find they have a very spiritual significance. The Bible gives us pictures of rainbows when we read about the throne of God and the presence of God. Ezekiel 1:28 - I saw that from what appeared to be his waist up he looked like glowing metal, as if full of fire, and that from there down he looked like fire; and brilliant light surrounded him. Like the appearance of a rainbow in the clouds on a rainy day, so was the radiance around him. This was the appearance of the likeness of the glory of the LORD. When I saw it, I fell facedown, and I heard the voice of one speaking. 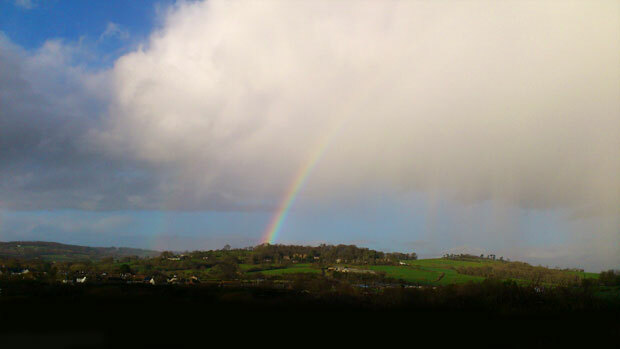 The picture below is from Devon in England but isn't actually a rainbow. If you compare it with our rainbow picture you'll see that the colours are actually upside down (so the red is at the bottom, not at the top!) 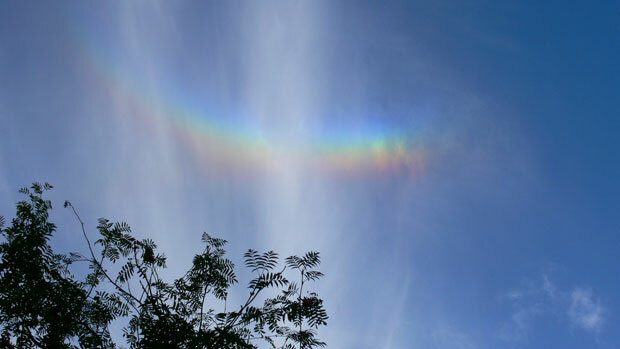 It's actually a 'circumzenithal arc'. But we include this here as the pic so looks like some kind of 'angel' with arms or even a Cross in the sky! These optical events in the heavens give us an awesome demonstration of God's glory. In Revelation 4, we get another glimpse into heaven and the glory of God. We find one sat on a throne, looking like jasper (probably green) and ruby (one of the four so-called 'precious stones'). The throne was surrounded by a rainbow that shone like an emerald (another precious stone). God is beyond our understanding, his colour and magnificence is beyond anything we can describe. Time and again, the Bible writers say God is 'like' something or has the 'appearance of'. God is beyond description, ornate, precious and rich in colour and majesty. We wrote a song called 'The Emerald Song' in response to Revelation 4, speaking of a sea of glass like crystal, an emerald throne, colours of splendour, flashes of lightning. Revelation 4:3 - And the one who sat there had the appearance of jasper and ruby. A rainbow that shone like an emerald encircled the throne. A Prayer: Lord, you are holy. You are pure, radiant, you shine and you defy any description we could give you. You are full of colour, beauty, precious stones and a burning and powerful love for us. Thank you for who you are. I choose to worship you for who you are - the magnificent God. Amen.